LYNWOOD– It’s difficult to resist deploying the “blood, sweat and tears” cliche here, because that’s precisely what Sandra Gao left on the court Tuesday in Mark Keppel’s CIF Southern Section Div. 2AA semifinal against Lynwood High. 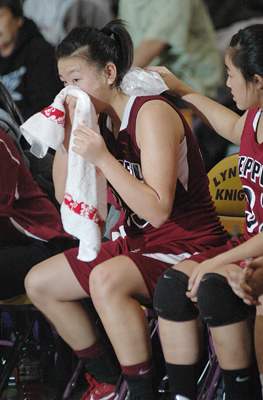 Play was halted late in the third quarter after Gao was whacked across the nose and bled onto the court, but when the game ended, it was her tears that needed to be mopped up, after Keppel lost, 62-60. Bloodshed aside, this was a superbly played – and well-coached – contest on both sides. Lynwood, taking full advantage of their edge on height and speed, jumped out to an early lead but Keppel at no point lost drive, tying the Lady Knights by the end of the first quarter. In the third period, Lynwood sprinted out of the gate, building their lead to as much as 10. The injury to Gao actually may have been a lucky break – not literally, as her nose was reported to be fine on Wednesday – as it stopped the game for a few minutes while she buried her face in a towel and her blood was cleaned from the floor. The unplanned rest seemed to reenergize the Lady Aztecs, who came back with crisper passing and a few key steals heading into the fourth. In the last quarter, a couple of miscues came back to haunt Keppel. A pair of missed free throws and some costly fouls kept them from overtaking Lynwood inside the final two minutes. A field goal by junior Alyson Lock brought Keppel to within two points, but it was immediately followed by Gao tumbling onto Lynwood’s Amber Blockmon, putting her at the free throw line for two shots. As in their quarterfinal win last week, Keppel got the ball into the hands of their star with the game on the line. Lock converted a pair of free throws with under a minute to play to tie the score at 60, but after two following Aztec possessions that failed to produce points, Lynwood’s T’keya Mason flew through the Keppel defense to hit a layup with 3 seconds to play. A long inbound pass to Lock at midcourt with 2.5 seconds on the clock was deflected by Lynwood and time expired without Keppel getting off a shot. As is often the case in championship basketball, this game may have hinged on the abililty to make free throws and control the ball, two things Lynwood did better at crucial moments late in the contest. At one point, Lynwood head coach Ellis Barfield was called for a foul for verbally abusing a referee, but Keppel’s Samantha Lee was only able to convert one of her two shots. She finished with seven points. Lock was the high scorer for Keppel with 34 points, with Gao adding 10. This is the second loss in as many seasons in the semifinals for Keppel under head coach Hon Trieu, who signed on to lead the team for the 2010-2011 season. Despite his satisfaction, however, his players were inconsolable, weeping openly after the loss. Assistant coach Joe Kikuchi said Keppel’s full-court press, which worked so well in the quarterfinal on Saturday, simply had little effect on the taller, quicker Lynwood lineup. 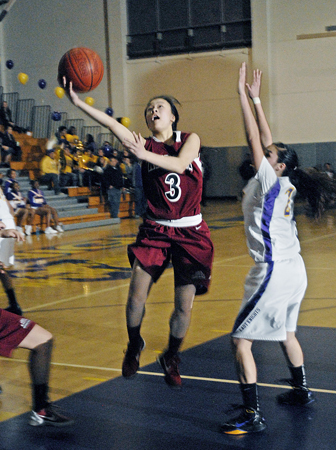 Mark Keppel frosh Lauren Saiki splits the Lynwood defense for two of her seven points on Tuesday, but the Lady Aztecs fell in their CIF Div. 2AA Semifinal, 62-60, at Lynwood High School. The Lady Aztecs are not done for the season, however. Their participation in the semifinals means they will certainly receiving a berth in the State tournament, the pairings for which will be announced early next week. Kikuchi said the team will be back at practice Wednesday or Thursday to prepare for State. Keppel must also be emboldened for the future, given the fact that they will only lose one senior – Gao – to graduation. The have a talented young squad, which feature,s among others, Lauren Saiki, who scored seven on Tuesday. The wispy thin frosh has proven her mettle all season, no more so than in these playoffs, with gritty play and fine work on both the offensive and defensive side of the ball. “I know she hurting now, as a freshman, but hopefully she’ll learn from this and come back stronger,” Arase said of Saiki. Meanwhile, down the 710 in Long Beach, Brea Olinda pulled out a rabbit of their own against the Jackrabbits, knocking off top-seeded Poly, 49-43, in the Div. 1AA semifinals. Poly had a chance to tie with inside of half a minute to play, but their shot missed the mark and the Wildcats came up with the rebound. At El Toro, Kelsey Minato led Huntington Beach with 14 points and Jill Nakaso added 11 in a 51-39 win the Div. 1A semifinal. The Beach moves on to the division title game, set for Friday at 5:15 p.m. at the Anaheim Arena. Culver City stayed close in the Div. 2A semifinal, but eventually fell to visiting Norco, 57-51. The Centaurs, featuring Torrey Mitsunaga, Mari Takahashi, Taylor Tanita, Misaki Nakagawa, Lindsay Terada and Kelsey Ueda, now await the announcement of pairings for the State tournament. On the boys side, Mater Dei and Jamie Kobayashi are on their way to the Div. 1AA final, after taking a 61-58 decision over visiting Loyola. The Monarchs will face Long Beach Poly for the title Sunday at the Anaheim Arena at 6:30 p.m.